“I am a 41 year old female from the Midwest, happily married but without children. I work about 50 hours a week at an IT position that is fairly high paced and stressful. I have a couple minor health issues such as bouts of eczema, reoccurring sinus infections and a seemingly slow metabolism; but my main concern I am hoping to talk about today involves my addiction to sugar. I know many people have a sweet tooth, but my sweet habits seem to go way beyond this. I try my best to keep junk food out of the house, but when cravings are high I will even go out of my way at night to make an ice cream, cake or cookie run. And once I eat one bite, the binge is usually not over until the entire container is gone. I am usually pretty good on eating a decent breakfast and lunch, but once mid-afternoon rolls around, my energy drops and I suddenly get an intense, uncontrollable need for sugar. All of my colleagues at work tend to bring in pastries, soda and candy on a daily basis and it seems almost impossible to avoid them. My husband doesn’t help much either and he often needs a rich dessert after our dinner at night, which is another time my sweet cravings and binging seem to increase. Thank you so much for sharing your story. I know it is not easy to be so open and vulnerable, so I commend you greatly. I also know that so many others deal with similar sugar addictions and I hope that they may find inspiration in your honesty. As you probably already know, the first step in solving any addiction issue is to acknowledge that it even exists, and this is not always an easy step. Now that you have acknowledged and embraced your sugar addiction, we must now discover a path that will begin to set you free from these chains. Refined, white sugar is a known common allergen to many people. According to Ayurveda, it is extremely Kapha-provoking and can create heaviness, congestion and toxins in the system. I mention this because your other “minor health issues” (eczema, sinus infection, etc) are likely being provoked by this daily sugar habit, and the heaviness, depression, low motivation and low energy also seem to be strongly correlated as well. Not all sugar is made the same! Now before we move on, I would like to say that sweet is indeed one of the 6 essential tastes that we need in our diet on a daily basis. It carries many healing properties when used in the proper context such as being rejuvenative, strength-promoting, nourishing and enhances love, compassion and happiness. However, the sweets we are referring to are far from the white powder that is poisoning our society today. Instead we are referring to natural sweets that are found in fruit, honey, maple syrup, whole grains and the like. And even these healthier options must be taken in moderation, especially if you are a Kapha type or are dealing with a Kapha imbalance (as it sounds like you are). Refined sugar possesses addictive qualities. 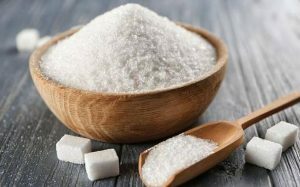 Sugar has been shown to cause addictive behavior, due to its ability to initially release high levels of the neurotransmitter dopamine, which is a major player in the “reward system” of the brain. Many other commonly abused substances (drugs, alcohol, etc) provide a similar effect, hence their addictive nature. The sugar also causes an immediate blood sugar spike (another addictive quality), followed by an intense blood sugar crash leading to extreme hunger and further sugar cravings. As you can see this can lead to a rather negative cycle of behavior. Addiction is a mental imbalance and therefore we must focus on healing the mind. Another important note that I hope to shine light on, is that although most of your complaints are on the physical realm, the addiction itself (any addiction) is in fact a mental disorder and therefore it is vital to address the mind, emotions and everything in between. Addiction is often brought on by our mental tendencies and past trauma, and if this is not addressed in a healthy manner, the addiction will never be cured. Addiction is often used to fill voids in our life, numb our emotions and indirectly deal with our anger, stress and sadness that we choose not to look at head on. Often this is done without awareness, so another area that will be needed to overcome the sugar addiction will be to go on an inward journey to discover the root cause of the addiction, which can often bring up all the nastiness that we have been trying so hard not to look at. So as with many treatments on a “natural” (for lack of a better term) path, things can get a bit messier before we find the health, happiness and freedom that we desire and deserve. 1. Start a Daily Food Journal. A daily food journal is highly effective in shedding light on exactly what you are consuming each day, and will help you avoid any “mindless eating” habits. If you can look at this in full awareness and honesty (which is far from easy), it will help you to put in perspective exactly how bad the addiction really is and what effects it is having on your life. Click here for a printable version of our Daily Food Journal. 2. Listen to your cravings, what are they telling you, where does the root lie? The next time you feel a binge coming on, take a step back, if even for a moment. Take a look at what is behind this intense craving. Is it low energy, high stress, sadness, depression, lack of sleep, overwork or habitual tendencies? Sometimes it may be a different cause, and other times it may be the same. If you are able, record any notable findings in your food journal at this time. This can help you to keep track of the main recurring causes that are driving your addiction. Once you are able to discover the psychological and physical causes that are stemming your sweet addiction, you can begin to find ways to deal with them in a healthy manner. For example, if you are prone to your mid-afternoon sugar fix to help you get past an energy crash, what are some ways we can help to create sustainable energy throughout the day? And if a crash does come, what is a better alternative to boosting your energy at that time? Once we target the causes, we can look at them dead on for what they are, instead of surrendering to them mindlessly each day. Overtime you will begin to identify your triggers more and more, and have your tools waiting to address them in healthy ways. When dealing with these major issues in our lives, we can often feel alone, as if no one else knows what we are going through. However, this is definitely not the case, as so many people are effected by their food and specifically sugar addictions. Therefore it will be essential to find others that have a similar story, that can help to support you through your healing just as you can also support them. If a support group is not what you are looking for, some other options include a therapist that specializes in food addictions, friends to call at your time of weakness, and family members that can offer an ear and a shoulder when it is needed. For your specific case, it sounds like it will be essential for you to have a bit more support from your husband in regards to the after dinner dessert. If he is able to give up this nightly dessert habit (which will also benefit his own health), this can be a huge support during a hard time of day for you. 4. Once you look directly at your sugar habits, begin to slowly wean off of them. Now that you have addressed exactly the foods that are being taken in, and looked directly at the causes and triggers to your addiction; we can now begin a thought out plan of weaning of off the “junk”. First you will need to see what your daily intake is. For simplicity sake, let’s say that you are eating an average of 4 candy bars and 2 cookies everyday. Instead of going cold turkey (which rarely works long term), begin but cutting this amount in half. Keeping with this example, this would then be 2 candy bars and 1 cookie each day. In order to make sure you continue to move forward, I would further suggest to set a date for the next step of cutting this new amount in half again. So I will then say, in 2 weeks I will go down to only 1 candy bar a day and no cookies; I will also mark it on my calendar and set an alarm on my phone to make sure I have as many reminders as possible. 5. Avoid all refined sugar in your home. It is absolutely vital to discontinue all of the foods and snacks that contain white refined sugar in your home. Unfortunately, you cannot control what happens at work or other areas around you, but in your home you must take control! This is another area in which your husband can show his support and help you by following this not-so-easy rule himself. If you are able to keep it out of sight, hopefully it will eventually become out of mind, at least when you are at home. And as we will discuss in the next suggestion, it will then be needed to find healthy replacements in order for you to have some “go-to’s” when your after dinner sweet tooth kicks in. 6. Discover healthy sweet alternatives to replace the refined sugar. 7. Find healthy alternatives to deal with stress and emotions when they come up. Since moderation is needed even with healthy sweet options, it will be equally essential to discover healthy practices to incorporate once you feel a sweet craving, stress or binge trigger coming on. Everyone is different in their likes and dislikes, so what works for one person may not work for another. The important thing is to be mindful when a trigger comes on, and then have your tool box ready to counterbalance the cravings in a healthy manner. Here is a general list of some tools to utilize at these times. Feel free to make your own list using these ideas and/or ideas of your own. Just make sure to have your list ready when you need it the most! 8. Nourish yourself, LOVE yourself! 9. Make sure you have a consistent routine of both sleeping and eating. To keep your appetite and blood sugar more stable, it will be important to find some stability in your own routine. Make sure you have a healthy established routine for your sleep habits, meal times and work if possible. Ideally it is recommended to go to bed by 10pm for optimal sleep and avoid staying up too late. Wake up time can be around 6am or 7am; meals should never be skipped and if you need a snack in between meals, keep it small, simple and healthy. 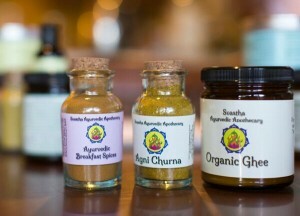 Click here for the Ayurvedic Daily Routine Chart. 10. Exercise your cravings away. A great way to balance your stress, emotions and yes, sweet cravings is to establish a consistent exercise routine. Exercise has been shown to help addictions of all kinds, as it also possesses the ability to increase dopamine levels; helping to boost the mood, confidence and motivation. No matter what your ideal exercise may be, it is it said that we should get some sort of intentional movement in for at least 30 minutes each day. This can be a brisk walk outside, some cardio at the gym (elliptical, bike, treadmill etc), swimming, hiking, weights, Yoga, Pilates, exercise classes or exercise videos. Whatever resonates with you, try your best to set up a schedule and be consistent with it each week. Even if it is simply taking a 20 minute walk each day or going to the gym for 30 minutes 2-3 days a week, this is a great start! 11. Invite a little help from our herbal friends. Herbs possess an infinite amount of healing benefits, and it is no surprise that they can help us overcome our addictions. Daily intake of bitter herbs can be useful to reduce our intense sweet cravings for both prevention and treatment of the cravings. In addition, bitter herbs tend to be great for aiding in weight loss and reducing other symptoms of a Kapha imbalance (sinus issues, etc), which may be some other areas that may also need addressing for you at this time. 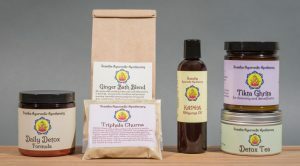 Here are some of my favorite bitter Ayurvedic herbs to reduce sweet cravings. Secondly, you will want to address the mental aspect of the addiction itself. Here are some of the most powerful Ayurvedic herbs for treating addiction (of all kinds). So Sugar Addict Anonymous, as you can see this is a long path of healing, that may be quite challenging. Of course you will need to utilize willpower, but as I mentioned, we must really focus on using mindfulness and honesty to begin to see the problem for what it is, which is a mental-emotional imbalance. Using these various tools, while taking it slow but steady, you can begin to overcome these eating tendencies you have acquired and find freedom from these chains. I recommend doing this one step at a time, creating specific initial goals and setting dates of when to add in more goals. This will allow you to keep a continuous forward momentum going. Of course if you have a bad day (which you most likely will from time to time), just brush yourself off and continue on. Have compassion for yourself, as this is a lifetime of conditioning you are overcoming, and major changes do not happen overnight. Please let me know your progress as you go through these recommendations. 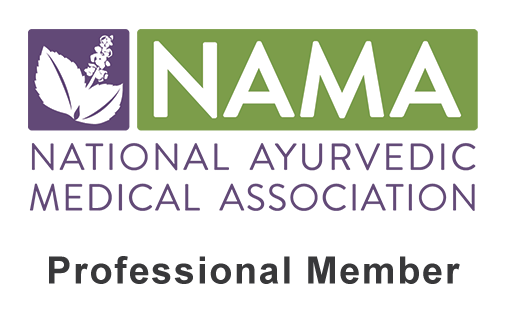 If you feel you need a stronger support system, I would ultimately recommend getting a full Ayurvedic consultation. This will provide you with a bit more individualized attention, a specific herbal regimen, and ongoing support emails to help keep you on track. Until you are ready, these steps will surely start you off in the right direction! Lots of love and light to you on your journey to freedom!